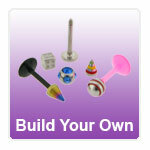 Build your own body piercing jewellery. Thousands of combinations of shaft materials, balls, spikes and cones in a range of colours and options. Here is your chance to build a piercing of body jewellery as unique as you are. Simply use our online step by step guide to build your own design of body piercing jewelry.